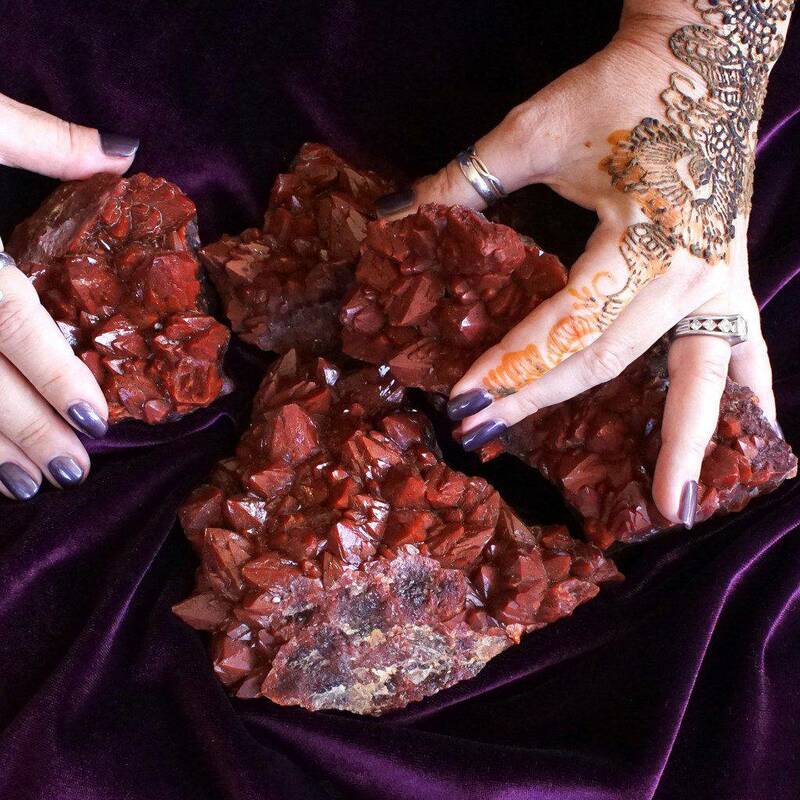 Many people come to me for the gems and minerals I offer at Sage Goddess, sourced from dozens of countries around the world, prized for their rarity, their beauty, and also for their metaphysical and healing properties. I’m a believer and a skeptic. I have a PhD so I’m a smart cookie. When I tell people that I do, in fact, believe crystals can heal the body, mind, and spirit, they often listen to me more closely than other sources because I’m a trained researcher and former professor. And I do believe that crystals have healing properties. Here’s how, in lay terms, I think it works. Let’s begin with a brief lesson in quantum physics, the study of particles and matter, which reminds us that everything – including you and me and all the things around us – is energy, constantly moving and vibrating on a subatomic level. Your vibrations and mine are different, just as stones themselves have different and unique vibrations and can be attuned to your energy, to energies of wellness and joy, or to energies of protection and safety. That’s what we crystal healers do – we sense and feel your energy and offer stones that align to your current or desired vibrational frequency. To me, it’s an art form. I sit with someone, their name, their vibration, their current state of physical or emotional wellness, and intuit what needs to be used to reach the desired state. When you bring stones into your spaces, they alter the vibrational patterns there. That’s why some spaces “feel” better or cleaner or more peaceful than others and it’s how I help heal spaces where trauma has occurred. Interestingly, you can overdo it. 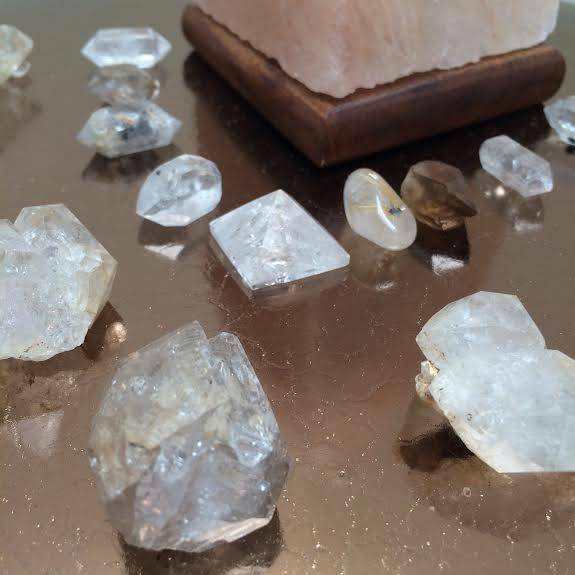 Too much clear quartz, which is the highest vibrational stone, in a space can make it feel frantic and stressful. High vibe stones should be balanced with stones of softer vibration in most cases, like rose quartz or tourmaline, to ease the flow of energy and slow down the vibration. Too much isn’t always a good thing, even when it comes to stones. 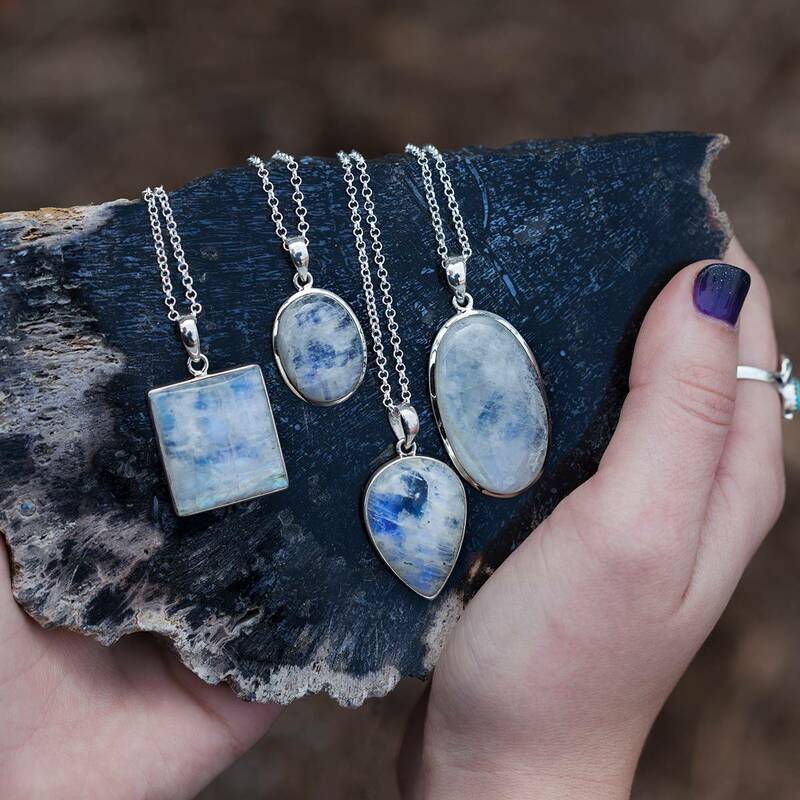 Stones also align to the meridians in the body, the Qi or Chi or Prana, to the Chakras or energy centers, and when used in contact with the body can offer healing and relief. While they may not cure disease, I have seen them soothe and mitigate effects of disease and harsh medical treatments like chemotherapy. In my own life, I have seen dramatic healing results both by using the stones and by keeping them in my space. 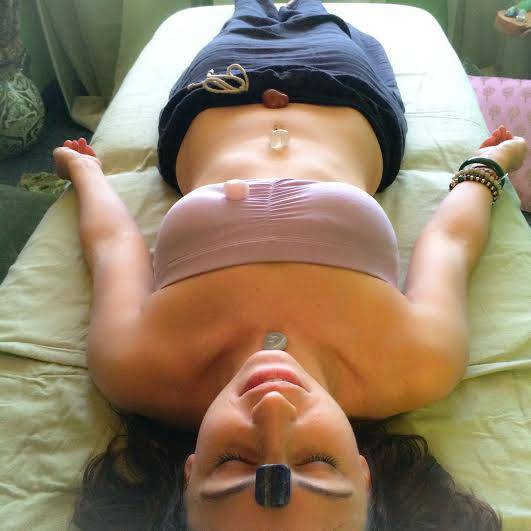 I also like to grid the body, which is what you see here – stones placed strategically on the energy centers to connect vibration to vibration and make sure that each energy center is activated and aligned with the gem that corresponds best to it. So for what it’s worth – world according to Athena – I think we have a divine Creator, you and me. I think that Creator made all the gems and minerals and assigned each one a unique vibrational fingerprint, then invited us to decode it, to sense and feel it, to work with it and chart it and learn from it. And then to begin leaning deeper into that intuitive space, which is where much of the mystery of life resides. People tell me every day that stones don’t do anything; they just look pretty. To those people I say, great! Enjoy their beauty. But I have 25 years of experience and anecdotes and personal evidence that working with the energies of stones can change your life. It can heal your heart. It can shift your mood, and balance your energy. It can improve your relationship, it can help you sleep better. And without any side effects at all. Except perhaps the cost of acquiring them which, if done over a lifetime, can be a process of pure joy. Stone medicine. It’s a thing. It’s my life’s work. If you’d like to learn more, I invite you into the space where I reside. It’s a pretty magical place where everything is energy and possibility abounds. So it is. As a customer, and an agnostic about many things, thank you for taking your time to explain this. 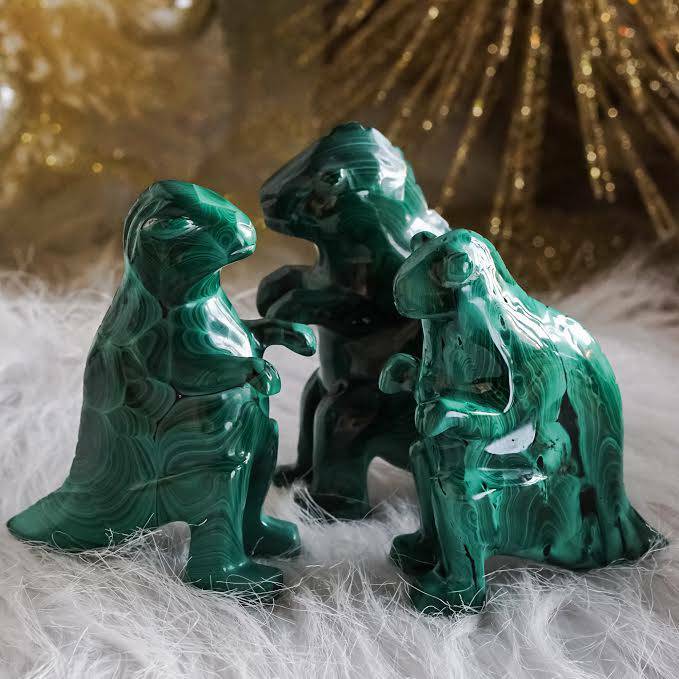 For me, I continue with my agnosticism, but know that the crystals I have purchased from you have helped me – whether by merely being pretty, or that something more that one can sometimes feel. I use them to help me meditate & relax, and they are helping me, & I am comfortable with that. PS – LOVE the sleep mist: I am ill & have much trouble sleeping, the mist has been fab on several levels: smells lovely (which is always important), helps me be calm & relaxed even if not quite asleep, and has improved my ability to sleep – thank you. Thank you for your comment and for being open to what I offered here! Thank you for this. I’m always eager to learn more about crystals and how they really work. I ordered a manifestation set from you and am eagerly awaiting it! I live in the Philippines so it’s taking awhile. It’ll be worth the wait though. Love your work! Thank you for the amazing work in the world that you do, Athena. I have been so drawn to everything that you offer. It’s all fascinating to me and helped me increase my knowledge about crystals and rock specimens that I have always been attracted to. I deeply appreciate all of your video and blog posts that I’m learning from daily. I love your vivacity and zest for life that serve as an inspiration to me. Thank you for being who you are!